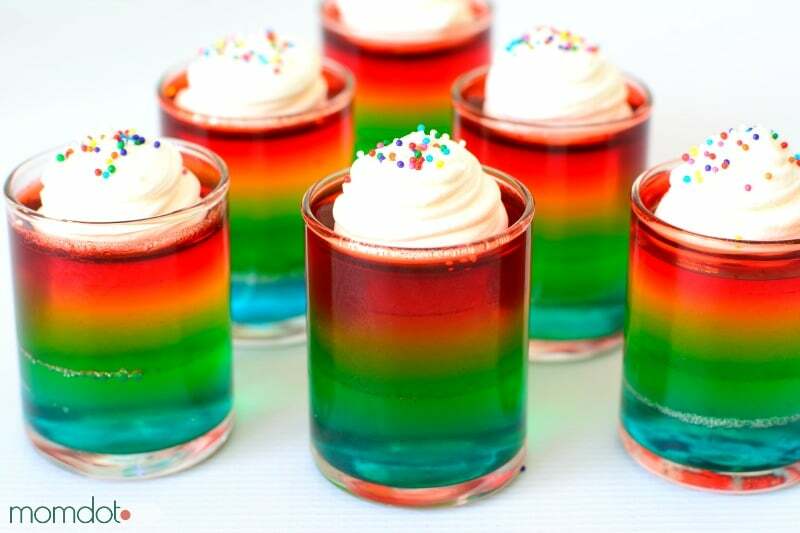 How to make jello shots that look like rainbows! This jello shot recipe is easy to follow and super fun for any party platter. Jello shots can be made with rum, vodka, or even fireball or if you are feeling randy, mix up the layers with different alcohol. Let’s face it, Jell-O shots come with some baggage behind them. Personally, even though I’m no longer the college student who thought Jell-O shots were the key to a fantastic girl’s night in, they are still pretty fun for a more adult party. Not to mention, they are delicious!Lately I have been sharing a ton of totally fun rainbow ideas. 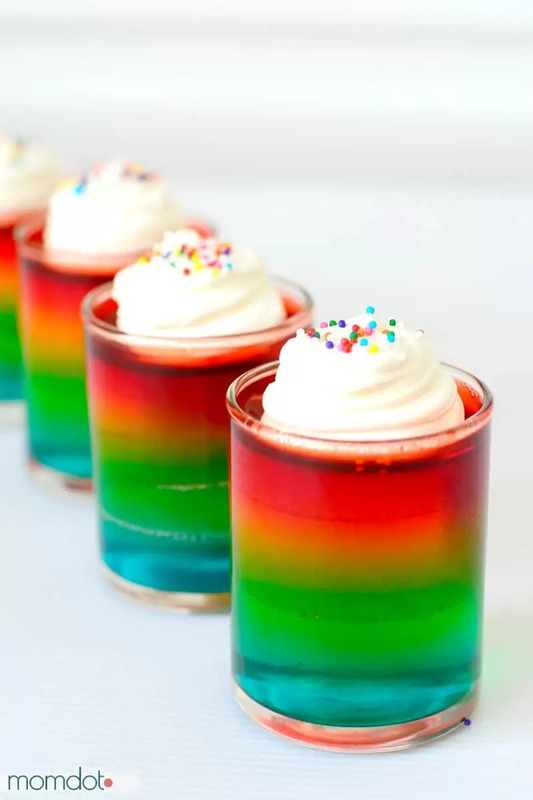 But I haven’t shared a lot of adult rainbow ideas so before the month closes out, I just knew that Rainbow Jello Shots had to make its presence known. Why? Because they are delicious. And pretty. Now keep in mind that if you make these, Rainbow Jello-O shots could easily be mistaken for a kid recipe. After all…rainbows, Jell-O, whipped cream, sprinkles… Make sure these are kept safely around the 21 and up crowd because…alcohol. You will enjoy making these and serving them up just as much as your next party will enjoy knocking them back! Just be careful, they can sneak up on you QUICK. 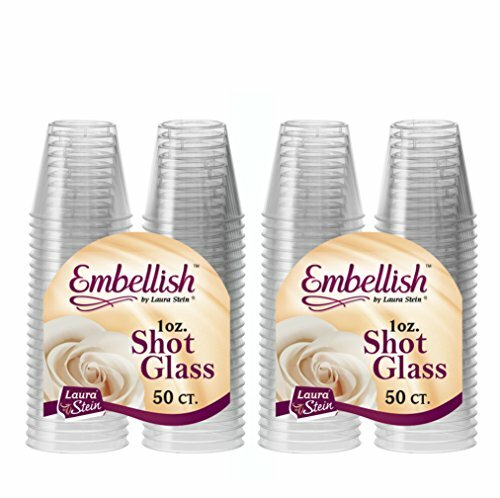 I put mine in glass shot glasses, but we found disposable bendable shot glasses so much easier to drink from because it’s easier to wiggle the Jell-O out – we found them at our local Party City. If you like the idea but aren’t a shot fan, serve them in shot glasses or other appetizer dishes with a tiny spoon. Classy and fun. You mean, other than a gorgeous way to liven up a party with pretty rainbows (or whatever color combo floats your boat)? Jell-O shots are a creative and fun way to serve up the alcohol to all your friends, kick back with a game of Cards of Humanity, and let loose. 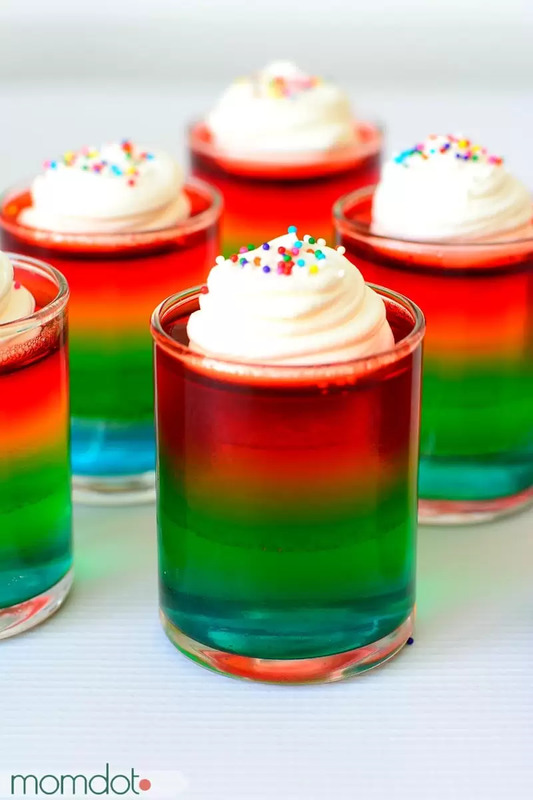 You can make Jell-O shotswith one Jell-O flavor, which is the simplest to put together, or you can get creative by blending mixes, creating stripes, or even rainbow colors like below. Pro-Tip:If you like, drop fruit in the middle before your JELL-O sets. I’ve had good luck with colored cherries or pineapples or candy like gummy bears or Swedish fish. 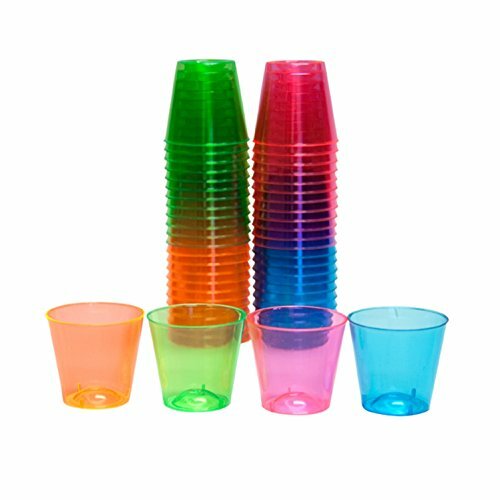 You can also make them in a DISPOSABLE SHOTGLASS for parties! Just grab one of these sets to create your masterpieces, and your party can grab and go! 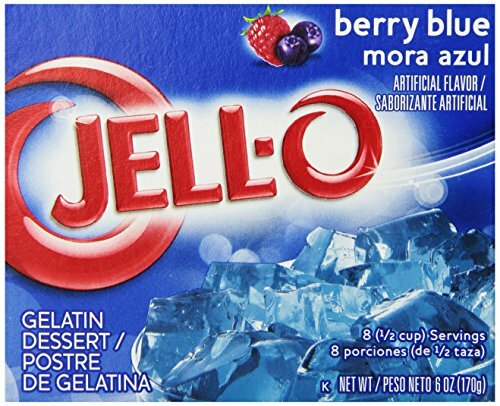 Be sure to plan out your timing before you start working – remember Jell-O takes time to set up in the fridge! In a medium bowl, stir together blue Jell-o and boiling water until the Jell-O dissolves. Add the vodka and cold water, and stir to combine. Pour 2 tsp of Jell-o into 16 shot glasses. Pro-Tip: I recommend setting out all your shot glasses out on a tray or baking dish. It will be SO much easier to shuttle them in and out of the fridge, add colors and flavors, and serve them to guests. Repeat with the remaining colors, layering them from blue to red in rainbow order. Full cups, if you don’t go the rainbow route, should take about 2 hours to chill completely. For layered shots, each layer of Jell-O will take about 30 minutes to set in the fridge. You want to wait for at least this long to keep the layers from bleeding together – remember you’re pouring boiling water on top of the base layer so taking a few extra minutes is worth it to make sure the final product comes out the way you want it. This means that 6 layers like I’ve done here will take you about 3 hours of cooling time. 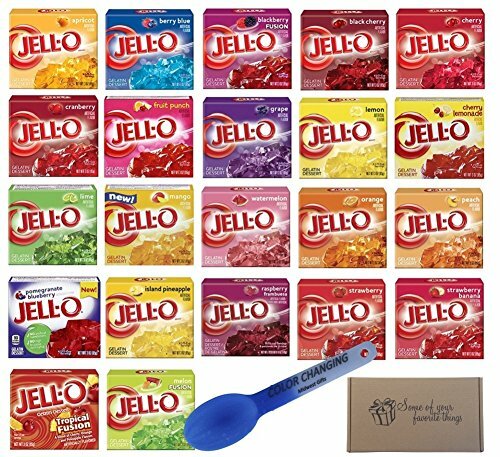 The more colors you add in your jello shots, the longer your process, although it is pretty straightforward to mix the batch, pour it on, and get back to something else. 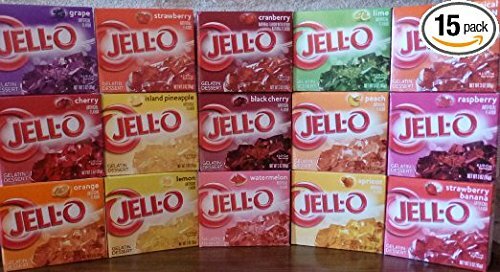 Pro-Tip: If you keep your vodka in the freezer, not only will it be icy cold for drinking, but it will help the Jell-O set faster which can make all the difference for a complex color combination. 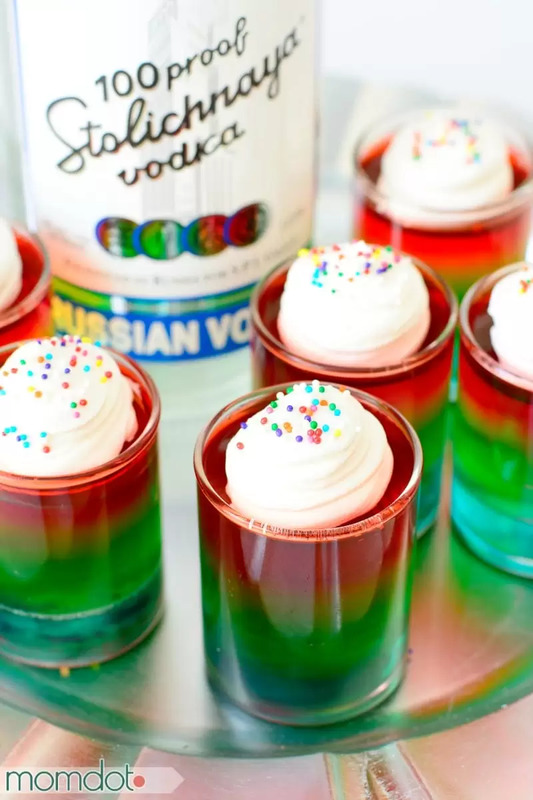 While rainbows were my theme this month, I think Jell-O shots can be great at any kind of party, especially those big playoff football games coming up here – mix up your team colors and share the team spirit with all your tailgaters or watch party visitors. 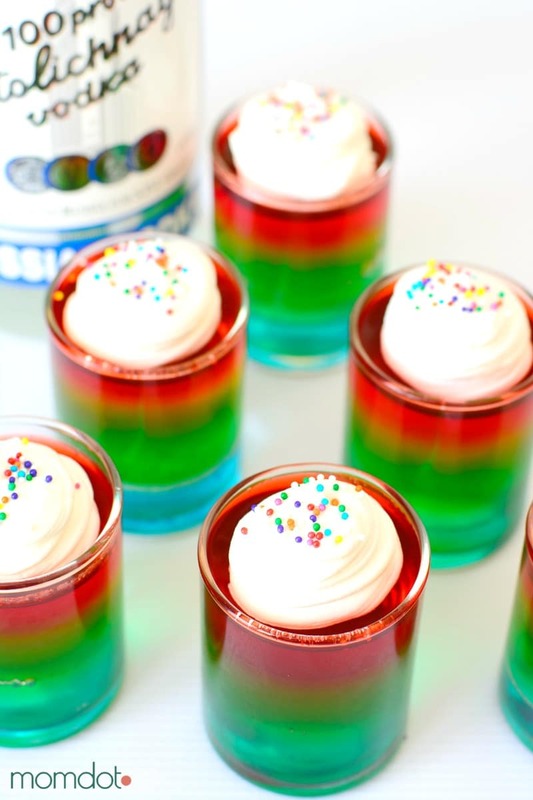 Add any sort of topping you like to your shots – whipped cream, sprinkles, gummy candies, etc. can add to the festive flair and the fun! What is your favorite combination for Jell-O shots? Grab your JELL-O and save yourself the drive!